This exciting follow-up to our smash hit Rainbow Riches franchise is for new and old fans of Rainbow Riches alike! In Rainbow Riches Pick'n'Mix, you're in control once you trigger the feature round. 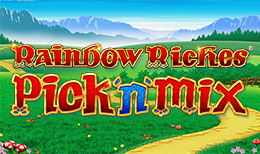 Rainbow Riches Pick 'n' Mix is an online slots game from developer Barcrest, and is another variant of the classic Rainbow Riches game that has been around since 2006. As with the other games in the series, it makes use of an Irish theme, with shamrocks, leprechauns and pots of gold very much to the fore. Read on to find out more about the key features of this Barcrest game. Rainbow Riches Pick ‘n’ Mix offers players five reels, three rows and 20 fixed playlines of entertainment. It is very similar to the other games in the Rainbow Riches series, featuring many of the same symbols on its reels. The game’s wild symbol is the gold coin, and this will substitute for a symbol on the reels apart from the bonus symbols. The bonus symbols in the game can be chosen by you. You are presented with a range of five symbols and you must choose three of them. Three or four of the same symbol across the reels triggers the relevant bonus feature. A winking leprechaun is the symbol for the Road to Riches bonus feature, while pot of gold symbol triggers the Pots of Gold feature. The Free Spins symbol is self-explanatory, while the symbol showing a leprechaun in front of a rainbow triggers the Cash Crop feature. Another bonus feature is activated by the mushrooms symbol. As with other games in the Rainbow Riches series, you can also boost your chances of winning big by opting to play the Big Bet game, where the stakes are larger and the prizes much richer than in the base game. Barcrest is a gaming company with a history that dates back to the 1960s, and they have manufactured many of the games that used to populate arcades in British seaside resorts in the late 20th century. If you enjoy playing fruit machines in the pub you will almost certainly have played some Barcrest games. The company started to make online games in the early years of the 21st century, which was when they produced their iconic title Rainbow Riches, which was first released in 2006. In 2011, the company was acquired by American gaming giant SG Gaming. SG Gaming has also acquired many other games developers in recent years. Barcrest continue their tradition of producing cabinet games for real world casinos too. If you enjoy playing slots online then you have probably already played one of the games in the Rainbow Riches series. If you have not experienced this iconic series yet, Pick ‘n’ Mix is a good way to introduce yourself to it. Smooth gameplay and great graphics help to make the game more immersive, while the bonus features are highly entertaining too. Make sure to keep an eye out for this entertaining and enthralling game in your favourite online UK casino!